When it comes to desserts, I have many loves…and while it can be hard to narrow it down, I can confidently say that I’m crazy for Cinnamon Rolls and for Funtetti Cake. And just like that, I knew the next dessert recipe that I had to create. 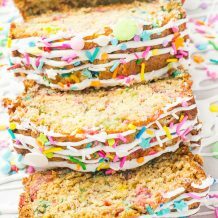 Get ready to love one of my most epic recipes ever…Treat your taste buds to this delicious Cinnamon Roll Funfetti Cake. It’s seriously one of the best desserts that you’ll taste. Think about what you love about cinnamon rolls…the taste of cinnamon and the sweet, sweet glaze, right? Now take those loves and pair it perfectly with Funfetti cake. It’s a match made in dessert heaven. What I love most about this treat is that I see it as perfectly okay to eat at breakfast, or after lunch AND dinner. In my mind, when I eat it at breakfast, it’s a moist and delicious cinnamon roll and when I eat if after any other meal, it’s an amazing dessert. The good news is that leftovers of this recipe taste great as well, but in all reality…will there truly be any leftovers? 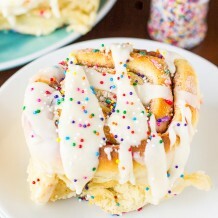 After one bite of this Cinnamon Roll Funfetti Cake, I’m going to wager and bet that there won’t be any left over! CINNAMON ROLLS: Make sure to buy the refrigerated flacky cinnamon rolls with icing or the flacky cinnamon twists because these are the ones that you can unroll and separate each dough strip. The other kinds of cinnamon roll dough, you will not be able to unroll the dough. BEFORE YOU START: Make sure to spray your pie dish or round cake pan with a generous amount of non-stick cooking spray. I also sprinkled a little bit of funfetti cake mix onto the bottom of the pie dish, this will help make it easier to cut cinnamon roll cake into slices. 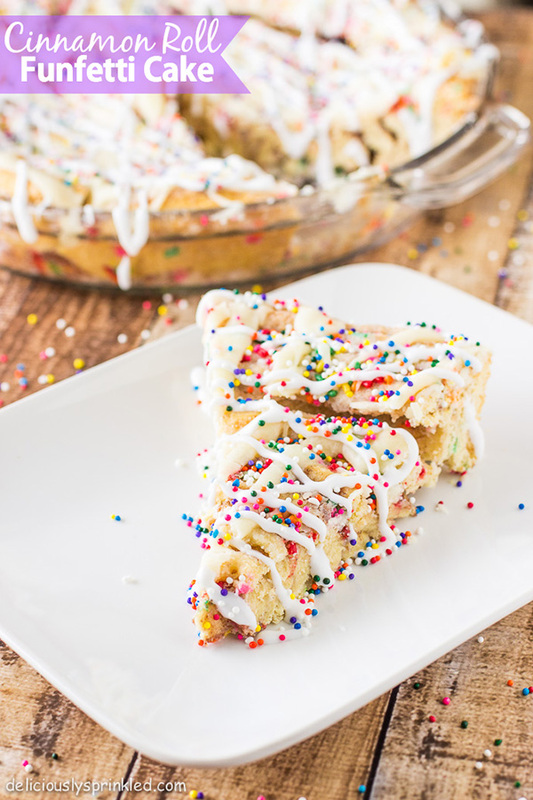 PERFECT FOR ANY OCCASION: I have made this cinnamon roll funfetti cake for many occasions. I just switched up the sprinkles on top of the icing. For Christmas I added Christmas colored sprinkles for a fun Christmas morning breakfast. PRE-STEP: Preheat oven to 375F degrees. Spray 9-inch pie dish with non-stick cooking spray and sprinkle 1 Tablespoon of Funfetti Cake Mix on to bottom on the pie dish. Set aside. STEP 1: Remove cinnamon roll dough from can. Unroll and separate dough into two rectangles. STEP 2: Place unsalted butter In a small microwavable bowl, and microwave for 30 seconds or until melted. Brush melted butter over cinnamon roll dough. STEP 3: Sprinkle 3/4 cup of dry funfetti cake mix over top of the dough. Separate each dough strip. STEP 4: Roll up one of the dough strips like you would a regular cinnamon roll and place it in the center of the prepared pie dish. Next, take another dough strip and press the end of the first dough strip to one end of the second dough strip, wrap the second dough strip around the cinnamon roll in the center. Repeat this step with the rest of the dough strips to create one large cinnamon roll. STEP 5: Sprinkle with additional funfetti cake mix. Bake for 18 minutes or until top is lightly brown. Let cool for 3 minutes before frosting. STEP 6: In a medium sized bowl, mix together both frosting packets that were included with the cinnamon roll dough and 1/4 cup of funfetti cake mix until combined. STEP 7: Drizzle frosting over warm cinnamon roll cake and sprinkle with colored sprinkles. Cut into triangle pieces and enjoy warm. I absolutely love this idea! One thing though. Should I separate and smooth out the dough in the sixth step? It looks like you did it before it was baked, but you did not leave any instructions to do so, so I was just wondering. They’re in a can too. Wow! That was fast! I bought Pillsbury Cinnamon Rolls Cinnabon with Icing. They are just round circles of dough. Not something that can be unrolled. Tried to make this for breakfast this morning, but the Pillsbury rolls I bought are not in dough form that can be rolled out. Is there a certain kind of cinnamon rolls that work? What kind of Pillsbury Cinnamon Rolls did you buy? I used the Pillsbury Cinnamon Rolls with Icing in the can. Oh my gosh this is genius. And so easy! Pinning to try soon! This cake is incredibly delicious looking!! 🙂 I would give anything for a huge slice of this right now!! Oh my goodness! I go away from my computer for a few days and I missed this glorious treat!!! Why have I never put sprinkles on my cinnamon rolls?!? No better way to start the day! This looks so sweet and delicious. Love all those sprinkles. These look amazing! And so simple! 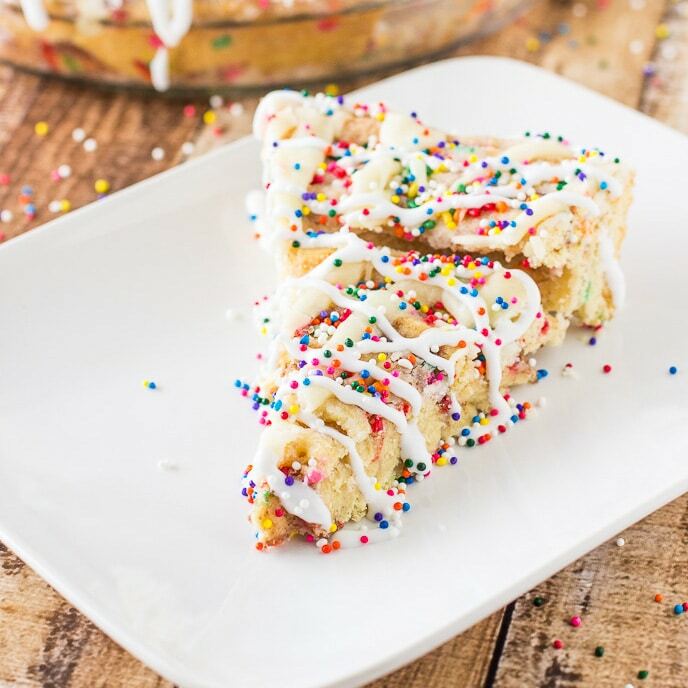 Jenn…….I want to have this cinnamon roll funfetti cake warm and waiting for me every morning so I can pretend it’s my birthday! 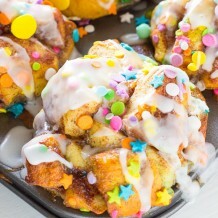 So festive looking and easy to make instead of waiting a million years for some rising cinnamon rolls! I am totally digging this recipe. 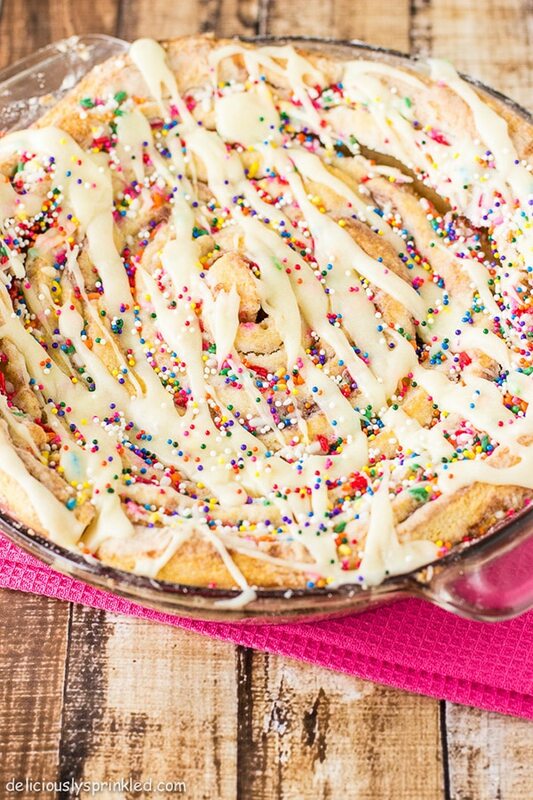 Cinnamon rolls and funfetti are a match made in heaven. What a fun and festive cake! I love all of the sprinkles! I have never seen a cake made from cinnamon rolls before. It’s brilliant! Oh my gosh! It’s so, pretty! This sounds and looks heavenly! So creative and festive. Delish! How fun… my boys would love this! There is sprinkles and frosting and I think you might be able to have this with breakfast. Fun! How can you not be happy eating that! Pinning! I love how easy this is yet looks (and probably tastes!) completely 100% homemade! What a fun cake! Looks delicious! I think I nearly fell over when I saw this recipe floating around all over social media today! I love this! I love that it’s under 5 ingredients! I love that it’s oh so pretty. I love that it’s oh so easy. Yum! That’s a really cute idea! Such a great gift for your hubby’s office! Holy cow, this is amazing! !